Thursday. Skills, ring mu's. Complex with a partner, 10min amrap of: 1 rounds of Bear Complex @ 60kg. Result, 30 rounds. 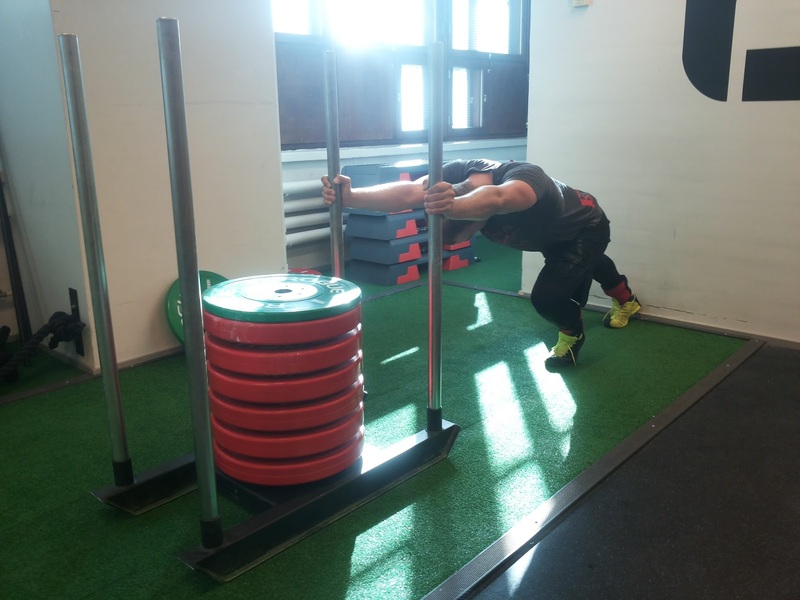 Sled push, every 2:00, perform 20m distance (up to 185kg). Farmer's walk 4x20m (up to 2x80kg). Training with Toni. That's quality time. My main man. We started this thing called crossfit together 3 years ago and trained for the first year or so at the same gym on a daily basis. Then he changed the place to a crossfit affiliate which was definitely a good move for him. The development took a leap further. Every now and then we get a change to hit it together. The daily crossfit speculation still continues every day =) Today I got him to visit my gym for more like a strongman type session. I took couple of sets muscle-ups on the rings and actually on the pull-up bar as well. These were okay today. Not the best I've had but still good. It was triples and doubles to get a total of 12 reps. Had no specific plan for these, just wanted to get some reps on and get some feedback from Toni as he has a coach's eye. Toni did some emom clean and jerk work at the same time. This type of complexes are very good for muscle endurance. You get lots of reps, and get fatigued in the process. Very valuable tool to improve the general physical preparedness, GPP. We had couple of options for barbell complex, there were some DT and Hammer type intervals on the table as well. Finally it turned out to be Bear Complex singles in a "you go, I go" style, meaning one guy does one set, drops the bar and hands the turn to the other guy. Bar was 60 kilos so it wasn't that heavy. We anticipated it might turn heavier in the process. I felt good for the entire 10 minutes. That was a positive surprise that I could have continued forever. Heavier bar might have worked well too. Got to say though that this kind of complexes are awesome when done with a partner. Haven't done bear complex in a while. Originally this would mean doing multiple sets without dropping the bar in between. That is 7 reps without letting the barbell fall to the ground. This was sick. We did 20 meter "sprints" every 2 minutes. Toni pushed it down the turf, and I pushed it right back. Have no idea how much the sled weighs but we started with about 80kg on the sled as plates. From then on we kept adding 10-15kg to the load. This was supposed to be for death. Let's build it up so that at some point you can't push the sled anymore. 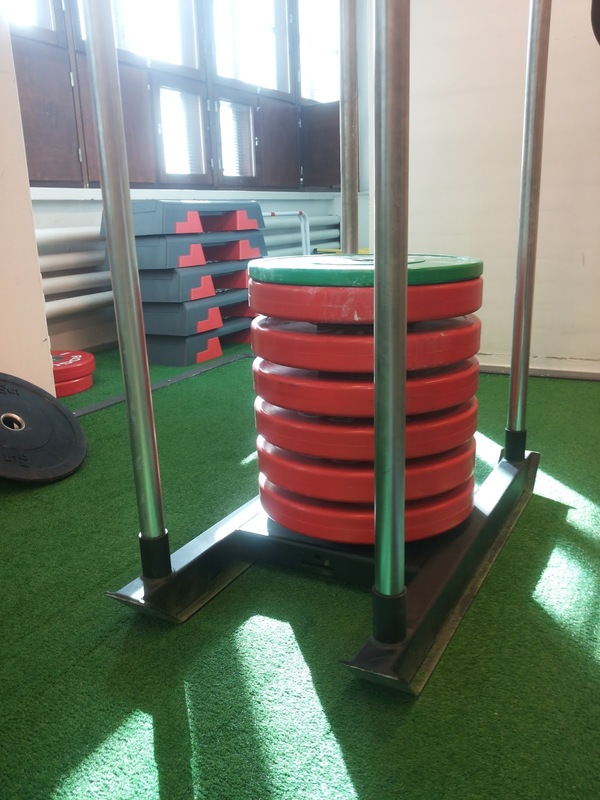 We ended up having 185kg (plus the sled) for load and there decided to stop after that set. It would have been the last set for me most likely. Not that there would been any room for more plates either. Maybe 10-15kg more would have been able to be there. Toni pushed this like a pro even though it was kind of a new element. This really burned the legs and it felt like someone hit the quads with a baseball bat. We were done after the sled. But once we didn't have to rush anywhere so we played around with the farmer's walk for couple of rounds. Nothing serious but the load was pretty good for us anyway. Really had to focus for these walks. There was 2x60kg for most of the sets, and the heaviest was 2x80kg load for 20 meters.